I have to admit, I feel a tiny bit bashful posting this recipe. After all, I just married into a ginormous Greek family, full of amazing Greek cooks. Who am I to post my new favorite Tzatziki?! Cooking, however, is all about trying and learning new things. I've really been embracing mediterranean and greek food lately, not only because I love the flavors, but the recipes and ingredients are usually fairly healthy. 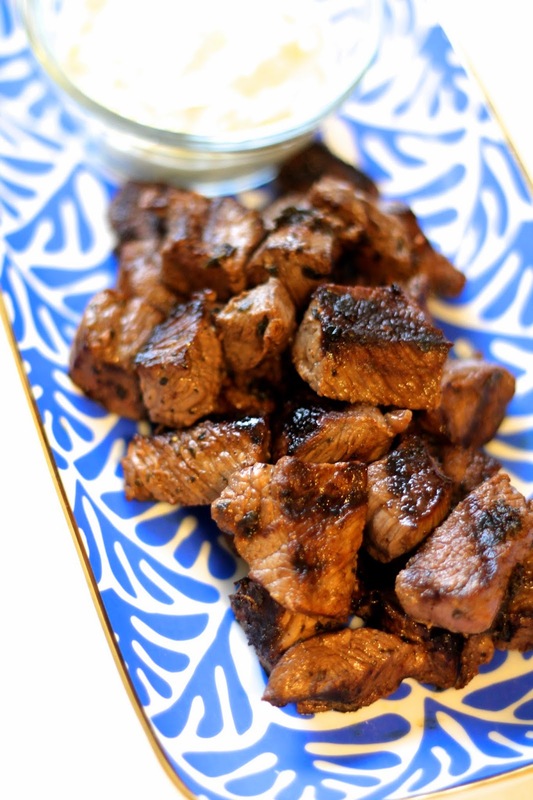 These beef tips have just a few ingredients, most of which you probably have on hand, and they pack some serious flavor. 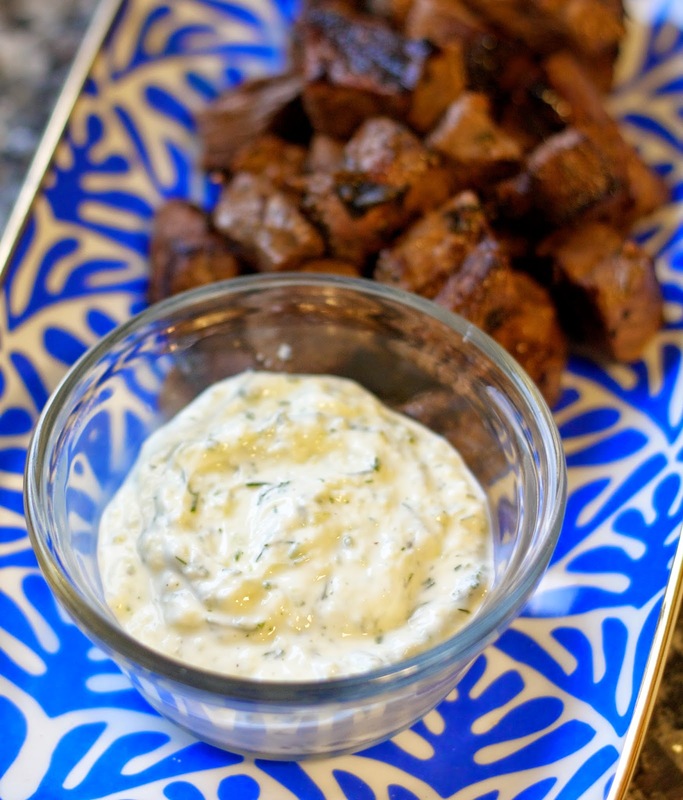 Topping the beef with cool, garlicky, dill-y tzatziki is the perfect summer dinner. I originally planned to make these as kabobs, but the weather was not cooperating so instead I tossed all of the beef tips on my indoor grill pan. This recipe serves two for dinner, but would make a great appetizer with a little pita bread as well. First, prepare the beef. Combine garlic cloves, lemon juice, olive oil, oregano, salt and pepper in a bowl. Add the beef and stir well to coat. Marinate in the refrigerator for 4 hours or overnight. To prepare the Tzatziki, start by seeding and grating the cucumber (cut it in half lengthwise, then use a small spoon to scoop out the seeds; use a box grater on the smaller side to grate it). Place the grated cucumber in a fine mesh strainer set over a bowl, and use the back of a spoon to press out as much liquid as possible (I ended up with 2 tbsp. grated cucumber). In a bowl, combine yogurt, grated cucumber, lemon juice and zest, grated garlic, fresh dill, salt, and pepper. Refrigerate until ready to serve. Grill the beef tips over medium high heat until done. 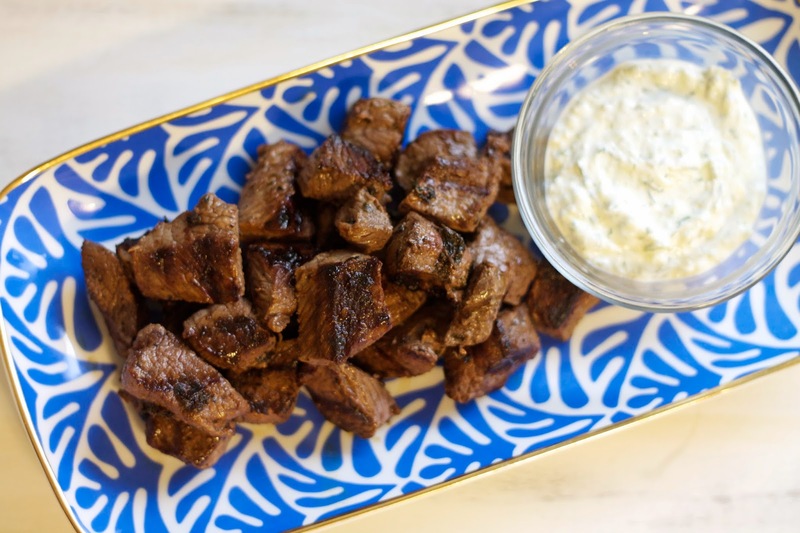 Serve warm with Tzatziki. Enjoy! this looks absolutely to die for! greek food is amazing. I just wanted you to know that you have an add that is pornographic. I have written down your recipes for tsaziki and the beef tips as they look good, but I will not be returning to your site due to the offensive add. I’m hoping that this is something you weren’t aware of and will get fixed! Thank you.